With today’s technology, you’d think it would be easy to meet up with friends for a drink on a Friday night. But if you live in a city with a lot happening, and have a diverse group of friends, it can be difficult figuring out what to do for the night—let alone getting everybody in one place. The Hotlist is a geo-social aggregating service that aims to make it easier by pulling from multiple social networking sites to let you know what events are most popular with your friends; the recently released Hotlist app puts the company’s geo-trending features on your iPhone. The Hotlist app links up with your Hotlist account and lets you find out what nearby friends are up to, view the most popular venues in your area, bookmark your favorite places, and see where your friends have been, where they currently are, and where they plan on going later. You can view venue profiles that include friend attendance, crowd photos, guy-to-girl ratio, and live Tweets from the crowd, and event profiles that include the event details, friends that are going, and basic information about attendees. Unlike location-based social networking (LBS) apps like Foursquare and Loopt, which use your smartphone’s location services and make you “check in” to different venues, The Hotlist relies on Facebook and Twitter to find out what your friends are up to. Since Facebook and Twitter are vastly more popular than the current LBS apps, The Hotlist should be able to offer a wider variety of events that include more of your friends; it could also appeal to privacy advocates who don’t feel comfortable with LBS apps constantly broadcasting their location. 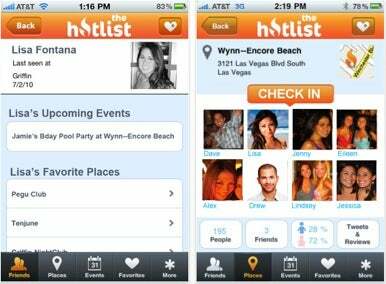 The Hotlist is a free app that runs on iOS 3.0 or higher.